If you’re looking for a unique dining experience in Hawaii, make reservations for dinner at the Shore Bird Restaurant and Beach Bar. The open air, oceanfront restaurant located in the Outrigger Reef on the Beach Waikiki affords a gorgeous sunset view from Waikiki Beach, making this a great spot for a romantic interlude. But it’s not your usual restaurant meal. Once you’ve placed your order, your server will bring your fresh meat or seafood entrée to the table – for you to cook. You’ll be instructed on suggested cooking time for your entrée and sent off to the community grill. The grilling area features a professional grill and is equipped with various cooking sauces, spices, and barbecue utensils as well as a large clock with which to keep track of cooking time. 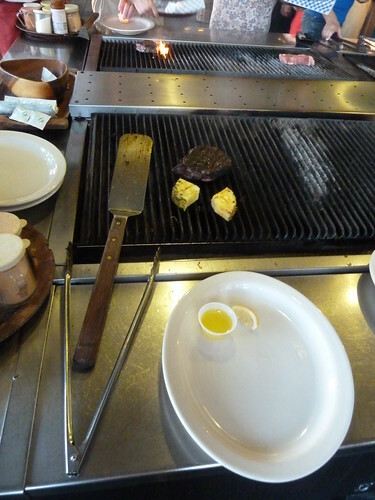 It’s a fun and festive atmosphere as diners mingle over the grill awaiting their entrées. Mai tai optional. How neat! Now I wish I were going there sometime soon…. That looks like it would be a really fun experience since it can be kind of boring waiting a long time for your dinner sometimes. I can even find my self wondering why on earth the chefs are taking so long to cook my meal when I’m starving already. © 2019 Kris Bordessa. Built using WordPress and OnePage Express Theme.